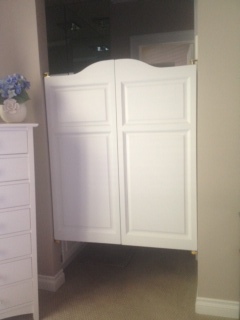 Custom made to fit a 36" or 3' Door Opening. Saloon Doors are in stock and ready to ship. The height is 38" (at the tallest point). • HAND CRAFTED from POPLAR- Poplar is a strong hardwood that is creamy white in color and may include streaks varying from pale yellowish brown to olive green. We recommend this as our paint grade wood due to the color streaks.